Here, then, is the tenth instalment of the story of how Mary Jones and Thomas Charles triggered a mission to the world. On the evening of Tuesday 6 March 1804, John Owen called to see Granville Sharp at his house on the other side of the Thames in Clapham and they discussed the following day’s meeting. They agreed to go the meeting together. The next day, Granville Sharp and John Owen walked down Bishopsgate Street (since 1910 known simply as Bishopsgate). One, the sixty-nine-year-old Sharp, was of medium height, with a pleasant, kindly expression on his face. Before leaving home, he had sung hymns, accompanying himself on his harp. The other, the thirty-eight-year-old Owen, walked with the self-assurance of a senior bishop’s chaplain. They were on their way to a meeting at the London Tavern. The older man was going willingly and with enthusiasm, though the responsibility of chairing the meeting was on his mind. The younger man, though relieved that his friend Granville Sharp’s name headed the list of those who signed the circular letter he received inviting him to attend, had accepted with some reluctance. They arrived at their destination on the west side of the street. 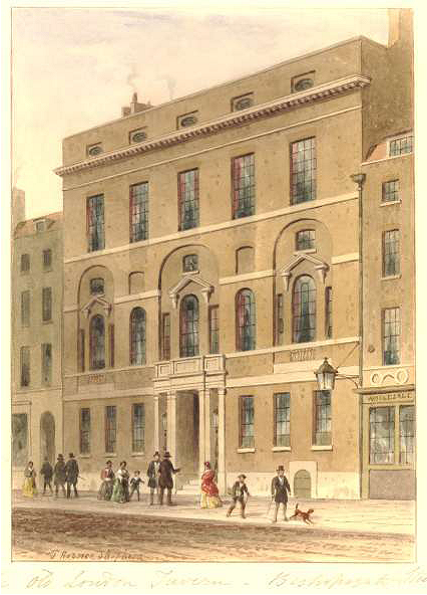 The London Tavern, which had been erected in 1767, was an elegant building with a neoclassical façade so that it looked more like an assembly room than a pub. A non-religious venue had been chosen so that the Society which was about to be launched would not be identified with any particular church or dissenting body. Taverns and coffee houses (the two were closely related) were a firm part of the City of London’s landscape and served as meeting places for City businessmen to transact deals and receive clients. Sharp and Owen entered the Tavern with its complex of rooms on three floors and made their way to the great banqueting room “with its fine Turkey carpet and culinary turtles swimming below in cellar vats”. The Tavern was famous for its turtle soups. It was demolished later and its most likely location was the existing office building at 1 Bishopsgate which today is occupied by HSBC. John Owen was ushered into a side room where a busy group was putting the final touches to the resolutions on which the meeting would be invited to vote. The meeting planners, in a shrewd tactical move, handed him a piece of paper on which they had written out the resolutions which would establish the basis of the Society now to be formed. He agreed but with no great enthusiasm and was led back into the main hall where 300 people from a wide range of denominations had now assembled. At noon, Owen’s friend Granville Sharp, a number of whose anti-slave-trade friends had turned up, was unanimously invited to chair the meeting. Wilberforce’s involvement in the campaign against the slave trade, and the threat of war from France, had prevented him from attending the meeting in person – but he had been intimately involved in the preparations. Sharp agreed to take the chair, manfully overcoming his hatred of chairing meetings. He much preferred the detailed work of assembling evidence for his anti-slave-trade campaign to appearing or speaking in public. Four men, including Joseph Hughes, addressed the meeting, outlining the need for the Society and the nature and scope of the work they planned it would do. Hughes was eloquent and convincing but heavy in his style. While few disagreed with what he said, there was no great excitement when he sat down. And then Karl Steinkopf rose to speak. He was thirty-one with striking good looks. He had been educated at Stuttgart and taught at a college in Tűbingen before becoming pastor to the Lutheran church in Savoy. He began to speak in “broken but good English” and engagingly described the scarcity of Scriptures on the continent of Europe. He appealed to the compassion of British Christians on behalf of his German brothers and sisters. Owen never forgot his “unaffected simplicity”. When Steinkopf sat down, there was scarcely a dry eye or hard thought in the house. Almost at once, John Owen rose to his feet on an impulse which, as he later recorded, he had “neither the inclination nor the power to disobey”. He made a powerful speech in support of the proposed Society’s objectives. He moved the adoption of the resolutions which established the British and Foreign Bible Society and embodied its form and constitution. Owen’s description of the meeting (referring to himself in the third person) got to the heart of its significance and successful outcome. Surrounded by a multitude of Christians whose doctrinal and ritual differences had for ages kept them asunder, and who had been taught to regard each other with a sort of pious estrangement, or rather of consecrated hostility; and reflecting on the object and the end which had brought them so harmoniously together, he felt an impression which no length of time would entirely remove. The scene was new: nothing analogous to it had perhaps been exhibited before the public since Christians had begun to organise against each other the strife of separation, and to carry into their own camp that war which they ought to have waged in concert against the common enemy. To him it appeared to indicate the dawn of a new era in Christendom; and to portend something like the return of those auspicious days when the multitude of them that believed were of “one heart and one soul”; and when as a consequence of that union, to a certain degree at least, “the Word of God mightily grew and prevailed”. The resolutions were carried unanimously. Those present subscribed over £700 on the spot – a sum approaching £50,000 today. A warm speech supporting the key resolutions by the chaplain to the Bishop of London had come as music to the ears of the RTS committee members who had worked so hard for fifteen months to establish the new Society. John Owen became the Church of England secretary to the Society and its first historian. One of his daughters married Wilberforce’s eldest son. You can read the eleventh episode of this story on this blog tomorrow.